In this series of blogs I hope to explore a little of the musical devices and techniques employed by song writers in very well known songs. In order for the non-musician reader to understand what is going on, he needs to be familiar with some basic concepts - some rudiments of music. I will attempt to keep this as simple as possible and narrow the focus so that all that is discussed is pertinent to song writing. There’s a fine line between being simple and not being patronising. I hope that a person with no understanding of music will be able to follow this thread. Those with some or a lot of comprehension probably don’t need to read this at all. When we listen to songs, the sort that have been familiar to us in the 20th and 21st centuries, we normally have a melody sung by a singer and underpinned with chords or harmony perhaps played by a piano, maybe also with an added rhythmic impetus supplied by drums or percussion. It's easier if we visualise it. Think of the songs we know as one thin line of melody supported on fat columns or pillars of vertical sound. Chords are just several notes which are played together at the same time, or so close together that the ear hears them as one chord. We will see later how a chord can be energised by a piano. A B C D E F G A B C D E F G A B C D E F G , etc. The gap from A to B is a 2nd, 2 letters. The gap from A to C is a 3rd, 3 letters. The gap from A to D is a 4th, 4 letters. The gap from A to B flat is a 2nd, 2 letters, but a different kind of 2nd. The gap from A to C sharp is a 3rd, 3 letters, but a different kind of 3rd. 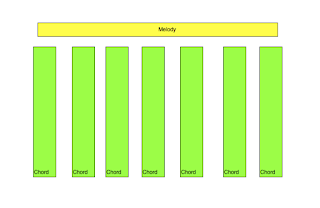 Most of the chords that popular music use in harmony are based on 3rds. But because of the different kinds of 3rds, they don't all sound the same. Some sound pleasant and some sound harsh. We need to understand the concept of tonal centres. Every song we hear has a fundamental note which the music gravitates toward. If you sing Frère Jacques and then ask someone else to sing it, you may notice they do not start on the same note as you. But you still recognise the song because the relationships between the notes remains the same and the tonal centre, in this song the very 1st and last note you hear, is easily recognised. This is important. You recognise songs because of these inner relationships between notes. Here’s a picture for you: imagine you are sitting on a train next door to your friend discussing your lives. Two hours later the relationship between you and your friend is unchanged - you are still sitting side by side. But the train has moved cities. That’s more or less how tonal centres work. By extension, that tonally centred note can be the basis of a chord, typically built of 3rds. We could have a song with a tonal centre of C and a fundamental chord C E G. And the range of notes the song has available to it starts on C and progress through the alphabet from C: C D E F G A B C D E F G A B C . We call C note 1; we call D note 2; we call E note 3 and so on. The song is at its most stable when the melody uses the C (note 1) and the harmony underneath uses the chord of 3rds built on it - C E G. As soon as the melody or chords move somewhere else, we create an instability known as tension. So if my melody moves to B (note 7) the ear wishes for this tension to be removed and return to the C (note 1.) It could do this by dropping down 7 notes back to C, or rising one note to the next C which in that case would be called note 8. The writer's skill is in manipulating this relationship between stability and tension. We need a small amount of tension so that we feel its release when stability arrives. A piece of music which does not leave C or the C chord, would be in danger of becoming boring. A piece of music which leaves it for too long might make us feel very uncomfortable. Where is the balance? Composers are always experimenting and looking for new ways to take their listeners on a journey from stability towards tension and back again. There are many techniques available to songwriters and we need to look at just a few others before we conclude. A composer could stay in the same tonal centre, but stretch a side of his musical edifice by introducing a note not normally connected with it. If he used C D E F G A B C most of the time, but sometimes introduced a black sharp or flat, your ear will notice. 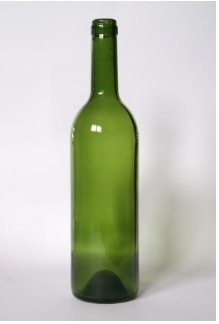 When we look at Elton John’s ‘Candle in the wind’ you will see he does exactly that, with a note of B flat. 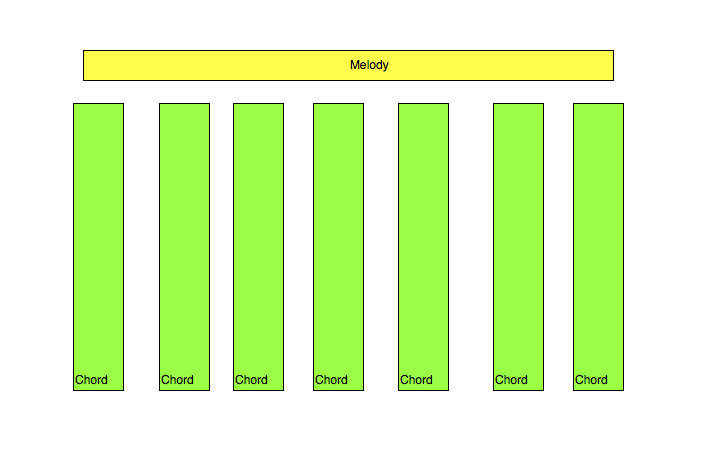 We have talked of Chord 1 being built on C.
Notice how C is the lowest note. As long as it, there's a similarity to this image. Once we change the lowest note, the ear is drawn to it, quite often because it imparts a melodic quality to a chord in a series of chords called a chord sequence. These chords with new bass notes are known as inversions. The same notes, just re-arranged. Two other theoretical points, and then we will crack on with looking at a song. and all of these could be manipulated in the way chord I ( C ) can be manipulated. Without even mentioning aspects of rhythm (the activation of sound in time) you can appreciate how his/her palette of chords has increased significantly. Finally, the musician can spread chords. If you hit a table top with 10 finger tips, lift them up and repeat it, you are pretending to play a chord on a piano with all the notes sounding at the same time. But you could start with your left hand little finger and one by one move to your right hand little finger, and this would in effect be like playing 10 consecutive notes. If the only notes you struck were C E G then we would still recognise this as the chord of C, because the time gap between the fingers is small. The next blog will look at ‘Candle in the wind’. If there is anything which seems unclear, please say so. This is written by an educated musician and it is difficult to stand in the shoes of someone who knows little or nothing about music. If this is too hard to grasp - come back and tell me. In the meantime, if you are not already there, visit www.everyheartisasong.com and listen to some new additions to the genre.